1. Cook the dal in pressure cooker with required amount of water.Once done add turmeric, spinach.green chilli and salt. 2. Cook it till spinach wilts and gets cooked.Then remove from heat. 3. In a wok heat oil and add mustard, when it cracks add shallots and garlic and cook it till it turns brown. Add this to the curry and serve with rice. 1. Cumin can also be used for tempering.I don't use as my hubby doesn't like the taste of it..
2. Do not over cook greens..
3. Dont add too much of water while cooking dal, recipe tastes good when it is slightly thick. 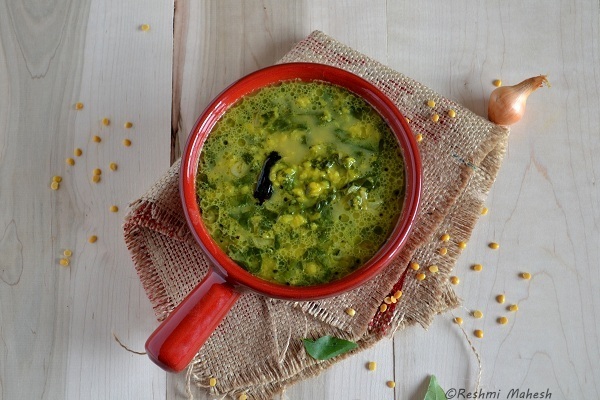 Excellent palak dal recipe,this is a regular in our kitchen as well and we just love it:)!!! My fav looks absolutely gorgeous! lovely, delicious and perfect !!! best comforting and healthy dish, dal palak...looks inviting and nice recipe too.. Delicious n perfect with chapatis and rice as well,yummy!! I agree with you when you say a perfect dish for lazy days,and top that its so very yum and healthy. Simple and yummy one, very beautifully captured. My favorite Dal. Sounds healthy n tasty. I can have this everyday for my lunch, my comfort dish. wow too good.. hv to try it. Healthy combo and so delicious! 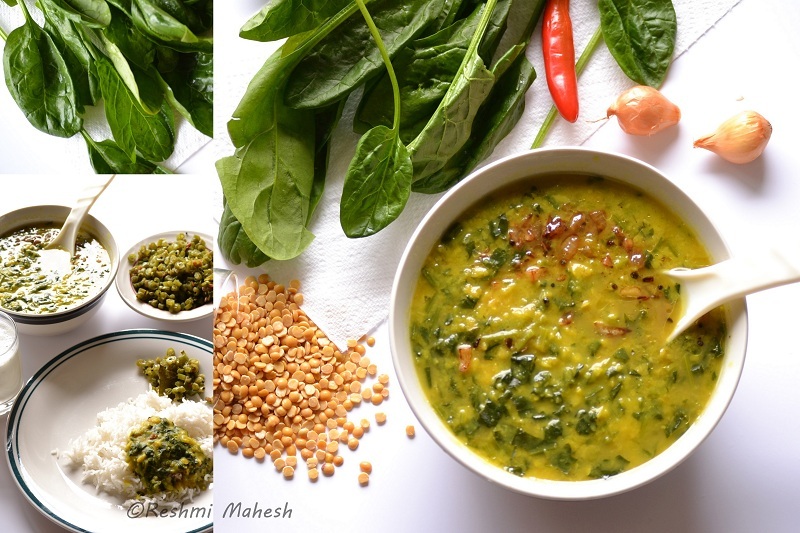 Wat a comforting and super tempting palak dal..
Yummy and comforting palak dal...lovely clicks. My hub's fav food...Looks good da..Pinne reshu im in pune.US il allato. palak dal looks delicious. Reshmi. Healthy too. I love dal palak a lot! Wonderful clicks, loved it! healthy and delicious dal..i too make this, use moong dal too at times..
We eat tomato-spinach dal everyday, literally every day! But I put the tempering & cook the vegetables & then put the soaked dal & pressure cook everything together. very healthy and tasty recipe.thanks for sharing. Luv the Pics!! Nice blog!! 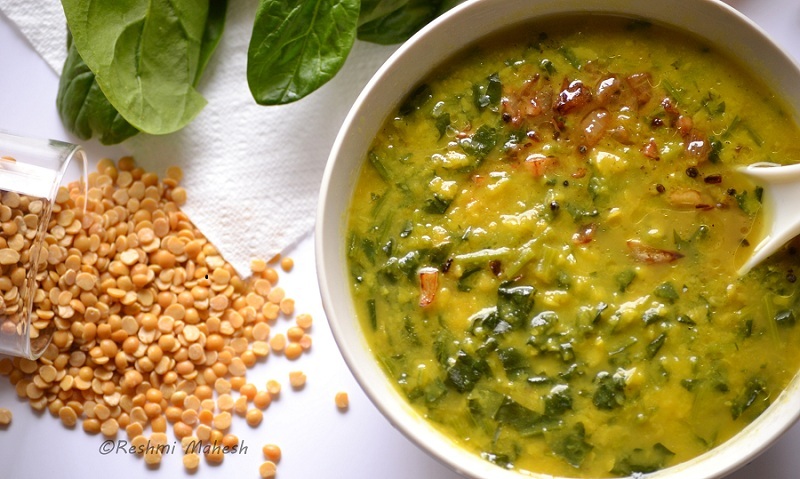 This's my absolute fav way to cook spinach--with dal! New site design adipoli kto. And so are the pics! Easy peasy curry alle..I too make this on lazy days,slightly different,love it. super and comfort dal. I am drooling here. Easy, colorful and nutritious ! the daal looks gorgeous! i love greens in my daal!